Boy Scout Troop 186 Scoutmaster Bob Barrage of Harrison displays a walking stick signed by the Scouts who have reached Eagle Scout during his 19 years as scoutmaster. Barrage has been involved with the Boy Scouts since 1968. When he was in the third grade in 1968, Bob Barrage decided he wasn’t going to join the Boy Scouts. His mother, Luella Heineman “Lu” Barrage, had climbed the ladder in Girl Scouts, achieving its top rank. She encouraged her son to go Birdville Pack 186’s meeting anyway. That way, he could decide for himself. “She knew that the unique and essential aspect of Scouting was that it was voluntary and self-directed,” recalled Barrage, 54. Halfway through the meeting, he reconsidered. Through that decision, he’s learned plenty of practical skills, helped plenty of boys reach the rank of Eagle Scout, and even met his wife. He spent two years as a Cub Scout. He then became a Boy Scout with Birdville Troop 186, the same one he had doubts about joining in the third grade. After attaining the rank of Eagle Scout, he served for 17 years as an assistant Scoutmaster. Though Birdville Elementary closed in 1989, Troop 186 still exists. The troop is chartered to Our Lady of the Most Blessed Sacrament Roman Catholic Church in Natrona Heights. Barrage of Harrison is Scoutmaster there, and has been for 19 years. In recent months, Harrison commissioners recognized him for his service, a gesture, he said, he appreciates. Barrage, who owns Wasilowski & Barrage Registered Architects in Harrison, said he stayed involved with Scouts because he believes it’s important and fun. “The aim of Scouting is to make a better future by filling it with better people,” he said. 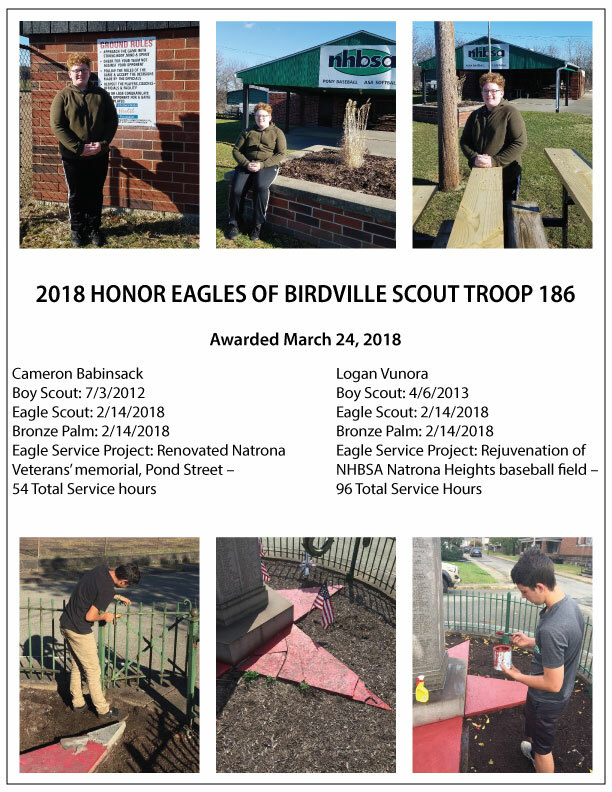 A fellow Scoutmaster at Troop 186, Evan Erickson of Buffalo Township, credits the experience he and Barrage had as Boy Scouts with keeping them active into adulthood. Erickson has been involved with the troop just as long a Barrage. His son, like Barrage’s stepson, Kevin Shaffer, attained the rank of Eagle. Besides acquiring those skills, he said, Scouts gain something else valuable: a lasting bond with those in the troop. Since its founding in 1942, the Birdville troop has produced 188 Eagle Scouts. Barrage remembers when he became an Eagle Scout in 1975. His father, Dr. Robert “Doc” Barrage, was the Scoutmaster. When the elder Barrage took out an Eagle Scout pin, his son handed him a handkerchief, knowing that his father would tear up. That family tradition has continued to follow Barrage through Scouting. His wife, Lori, was the mother of one of his Scouts. After bringing the bachelor Scoutmaster gifts like homemade zucchini bread, he jokes, eventually the message got through. Her son, who went on to become an Eagle Scout, was the best man at their wedding. Barrage said he has been blessed by the dedication of those involved.